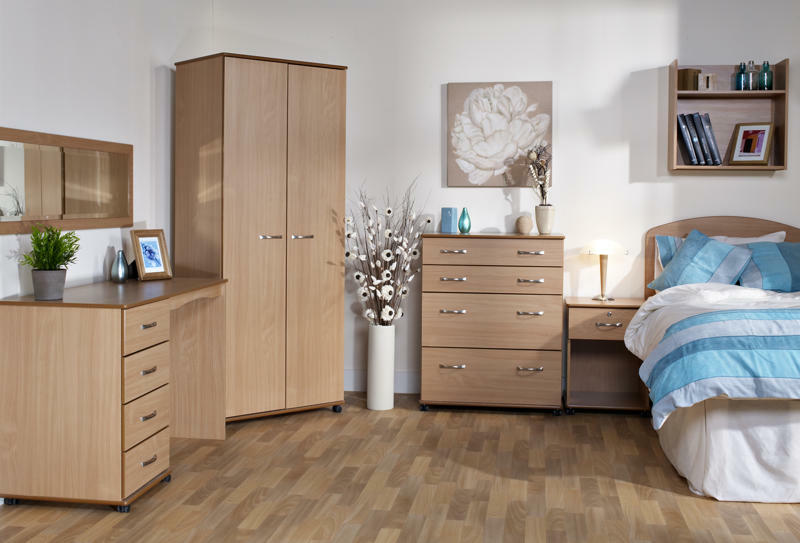 Factory assembled contract furniture range with a 5 year manufacturers warranty with the following specification: Carcase: 15mm Melamine faced particle board - Construction: Glued, dowelled and screwed. Metal KD fixings. Backs: Solid 15mm matching backs melamine faced particle board. Tops & Bottoms to all units: 15mm melamine faced MDF which are profiled and polished with smooth round corners. Drawers: Metal sides with easy glide roller runners, 15mm solid drawer bases and back rails. Hinges: 170 degrees all metal with reinforced plate. Handles: Solid metal or wood effect. Castors: Twin wheeled heavy duty contract castors. Specification: Constructed to BS4875 pt 7 level 4. Locks: Optional locks can be fitted upon request. Available in the following veneers; beech, maple, limed oak or rich walnut.